One of the things I love about quilting is the sense of community it fosters. While we quilters are an increasingly diverse group, there is that shared love of creating with fabric and thread and having our creations warm the body and/or soul. I love that even a pink haired twenty something quilter can have a point of interest that can intersect with that of a prim, blue-haired great grandma. There are quilting guilds galore, quilting clubs, and cars full of quilting friends who travel all the quilt 'hops' from shop to shop. Shows, conferences and retreats too. There are even quilting cruises! Absolutely amazing and wonderful. With the ability to hop on the internet and travel virtually world-wide, we can learn all kinds of techniques, 'meet' quilters from all over, and develop our own communities online. The internet, combined with quilting has given so many people an opportunity to build relationships and share their creativity. My friend Robin and I 'met' first on a quilting forum online, then met in real life. We quilters have a lot of love and friendship to share. Quilts of Valor, Project Linus, and many other great organizations have been formed as ways of blessing others with gifts of quilts and more. Quilters are a generous bunch! This blog and its growth just amazes me. What started as a crafty escape from the worries about a husband with cancer and 3 little kids has grown almost as fast as my children have. You might want to read how cancer made me a better quilter. Just this past week my YouTube channel passed 3000 subscribers! Being online has helped my interest in quilting grow, expanded my skills and knowledge, and pushed me to complete more projects than ever. I bet it has done similar things for each of you as well. My blogging has grown from a "Look what I did" personal journal of sorts, to a "Look at what I can do and here's how you can do it too" kind of thing. It amazes me that while most of my blog's readers are in the USA, there are still so many from so many different countries. Canada, the UK, and Australia are my next biggest readership, but there are visits from places like Latvia, Greece, Iceland, Bangladesh, and Zimbabwe. There are even a few visits from countries that I wasn't quite aware of until this blogging thing happened. 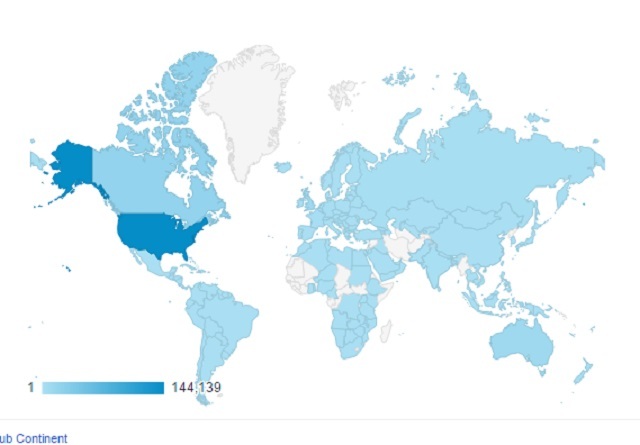 Google Analytics says I have received visits from 170 different countries! It's hard to believe that there are so many folks tuning in to read what I have written and posted. Map of visitors from Google Analytics for the last 3 years. Last week I was able to enjoy vicariously the excitement of a brand new quilter. She's a customer of the Janome dealership where I work part-time. She hadn't sewn at all and was so excited about her upcoming class that she quizzed me silly via the shop's Facebook page about machines. She had researched her machine choices and was determined that she wanted a machine she wasn't going to outgrow anytime soon. She ended up buying the brand new model Skyline S5 by Janome and she's used it so much in just one week that she's used an entire spool of thread just practicing her piecing. One of the things that I think has her so excited is that she's going to be taking her classes with a good friend and she's also had a cousin (or friend?) help her start doing some piecing once she got her machine. That's the kind of enthusiasm I now 'see' in my mind when I get great comments here on the blog. I am so blessed to have a small part in someone else's creative journey! I really think that without the people of quilting, the relationships it fosters, the people we gift the works of our hands to, quilting wouldn't be the heart (and body) warming craft and art that it is today. All this rambling is to just say thank you and to encourage you to continue to help and encourage other quilters as you have helped me. And there is room for the tattooed, pink-haired grandma and the young woman in business dress. And the men. Quilting is a great mixer. I agree that blogging encourages productivity! I'm relatively new to your blog, gearing up to try some of your quilting ideas soon. It is good to "get to know" you and your husband's challenges.And your quilting. Yep! Room for all kinds, though there are still some folks who are uncomfortable with the untraditional. But I think it's gotten so much better. I am a little jealous of the few local male quilters; the gals make a big to-do over them! Great post Amy! I, too, find it an amazingly warm and inspiring (quilting) world! Great post. As a younger quilter, I have a nice blend of quilting garnered from my mom and fellow quilters and I love that! I do giggle at the term 'younger quilter' because in my area, we're pretty rural and traditional. I have typically found myself the 'younger quilter' at age 43! What - no readers from Greenland?!?!? !